Click here to read more reactions to Happiness. A crumbling Liberal Arts College in rural New England is the setting for Chicago-area playwright Mickle Maher’s “There is a Happiness That Morning Is”, an unexpectedly raucous and joyously word-drunk celebration of art, ardor, academia. 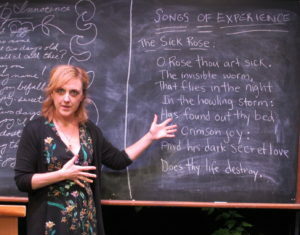 For twenty years, two professors have been carrying on a secret love affair while simultaneously lecturing on the poetry of William Blake – he on “Songs of Innocence”, she on “Songs of Experience”. But their classes today are going to be particularly challenging. Last night on the college quad, while conducting an impromptu al fresco lecture, the pair became so carried away while reading Blake aloud that they threw off their clothes and made mad, passionate love in full view of their students as well as the school’s puritanical president. Now, desperate to salvage both their careers and their love, they need to convince a scandalized campus community that this ‘public showing’ of their ‘dew-dipped thighs’ was the apotheosis of Blakean ecstasy or else suffer the consequences. Oh, and did we mention that the play is written, like Blake’s poems, almost entirely in rhymed couplets? This is one set of lectures no student (or audience) in their right mind would want to miss. 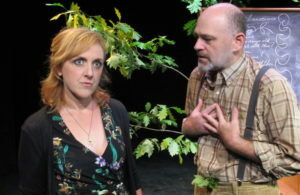 BRIAN PETTI (Bernard) is a Hudson Valley-based playwright and actor. 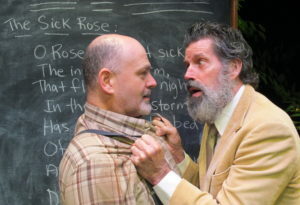 His Echoes of Ireland had the distinction of being the first play ever staged at the Bridge Street Theatre. Acting credits include Septimus in Arcadia (Rhinebeck Theatre Society), McMurphy in One Flew Over the Cuckoo’s Nest (Curtain Call Theatre), Jack in The Importance of Being Earnest (Creative Theatre). Brian is overjoyed to be working with John and Steven, in the theater they built out of whole cloth. STEVEN PATTERSON* (President Dean) has performed in NYC both Off- and Off-Off-Broadway, as well as regionally with theaters such as South Coast Repertory, Capital Repertory Theatre, TheatreWorks/Silicon Valley, freeFall Theatre, Kaliyuga Arts, Lexington Conservatory Theatre, Chenango River Theatre, Centenary Stage Company, and the Orlando, Oregon, Colorado, Pennsylvania, Utah, Tennessee, Richmond, and Lake Tahoe Shakespeare Festivals. A few of his favorite roles have been Jake Sturdy in Kill Me Now, Lear in King Lear, Austin Wiggin in The Shaggs: Philosophy of the World, David in Poor Super Man, Judi Boswell in How to Pray, Zach in A Chorus Line, and Rob in King of the Crystal Palace. He also created, performed, and toured internationally for four years with a solo show inspired by the life and works of Jean Genet called Beauty. On film, Steven can be seen as Bruce in Joseph Graham’s Vanilla and as himself in Bill Rose’s documentary The Loss of Nameless Things. He currently resides in Catskill, NY, and serves as an Associate Artist at Bridge Street Theatre, where he has appeared in The Epic of Gilgamesh, The Killing & The Love Death, Grinder’s Stand, A Life in a Day: Lucky Lindy, Frankenstein: The Modern Prometheus, Holiday Memories, How to Pray, Frankie & Johnny in the Clair de Lune, and The Revenge of the Space Pandas, and directed George M. Cohan’s The Tavern, The Effect of Gamma Rays on Man-in-the-Moon Marigolds, and The Revenge of the Space Pandas. MICKLE MAHER (Playwright) is a cofounder of Theater Oobleck and the author of numerous plays, including There is a Happiness That Morning Is; An Apology for the Course and Outcome of Certain Events Delivered by Doctor John Faustus on This His Final Evening; The Hunchback Variations; The Strangerer; Spirits to Enforce; The Cabinet; Lady Madeline; and An Actor Prepares (an adaptation of Stanislavsky’s seminal book). His plays have appeared off-Broadway and in theaters around the world, and have been supported by grants from the National Endowment for the Arts, the Rockefeller Foundation Multi-Arts Production Fund and Creative Capital. 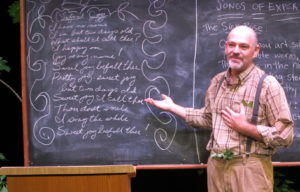 He currently teaches play writing and related subjects at the University of Chicago and Columbia College. 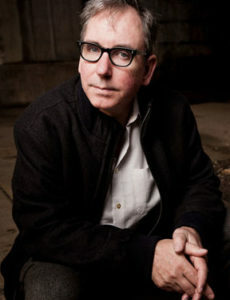 JOHN SOWLE (Director/Designer) is Artistic and Managing Director of Bridge Street Theatre. He founded Kaliyuga Arts in 1986 with his partner Steven Patterson and has received multiple awards for his directing and design work on their Los Angeles, San Francisco and New York productions. He has directed and designed BST’s productions of Leni, Redwood Curtain, How to Pray, The Official Adventures of Kieron and Jade, Frankenstein: The Modern Prometheus, Holiday Memories, The Epic of Gilgamesh, The Killing & The Love Death (late plays of William Inge), and Grinder’s Stand by Oakley Hall III, and designed their productions of The Tavern, The Effect of Gamma Rays on Man-in-the-Moon Marigolds, and Frankie & Johnny in the Clair de Lune. John has an undergraduate degree in mathematics from M.I.T and a PhD in Dramatic Art from UC Berkeley. 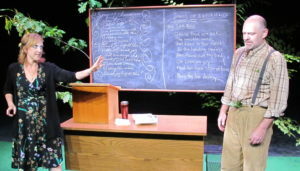 MICHELLE ROGERS (Costumes) began costuming plays while in college and continued working on high school productions throughout her teaching career. She’s designed costumes for Marat/Sade, A Midsummer Night’s Dream, Oliver!, and Pride and Prejudice, among others. Now retired from education, Michelle is delighted to be working with Bridge Street Theatre. She has been the costume designer for The Tavern, Frankenstein, The Effect of Gamma Rays on Man-in-the-Moon Marigolds, How to Pray, Redwood Curtain, Frankie & Johnny in the Clair de Lune, and Leni. JULIA ROTHWAX (Stage Manager), Julia steps into a Stage Management role after having appeared as Mrs. Rudich in BST’s production of David Mamet’s The Revenge of the Space Pandas this past summer. During the previous summer, she performed as a refugee in Voice Theatre’s production of The Skin of Our Teeth in Woodstock. She studies currently with the fabulous acting teachers, Seth Barrish and Lee Brock, at The Barrow Group in NYC. Stage Management is Julia’s third “act” – her second being performing and her first as a political operative and campaign communications director for notable Democrats including Bill Clinton and Bill Bradley. Julia is also a Board Member of The Voice Theatre. She splits her time between Woodstock and Brooklyn, NY. *Member of Actors’ Equity, the Union of Professional Actors and Stage Managers.